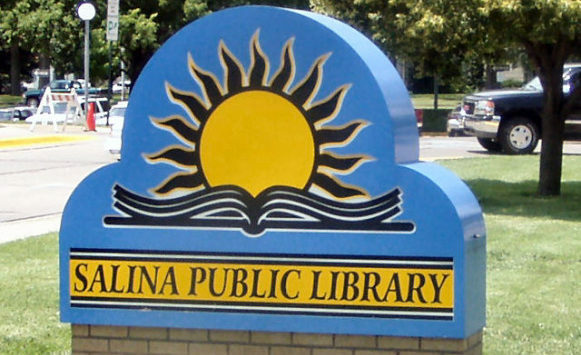 In 1965, Salina passed a bond issue to erect a new library building. Three years later, on Sept. 29, 1968, the doors to the current Salina Public Library were opened. The library will mark its building’s 50th anniversary with an exhibit on the building’s history and a reception. “50 Years on Elm” will be on display in Gallery 708 from Sept. 8 through Oct. 12. The public is invited to stop by for refreshments from 2-4 p.m. Monday, Sept. 10. “Since citizens first agreed to finance a public library in 1899 to the passing of the 1965 bond issue, Salinans have seen the value of the library,” Lindsey Miller-Escarfuller, the library’s director, said. The library’s first permanent building was a Carnegie library near the corner of Eighth Street and Iron Avenue. The library served the public there for 65 years, with an addition to the building completed in 1929. During this period, library collections and services continued to expand to the point that by the early 1950s, a larger facility was needed. However, it wasn’t until 1965 that the bond issue was passed for a new library on the city-county complex at Ninth and Elm Street. Since the Elm Street building opened, it has undergone many improvements and expansions. The Youth Services Department was moved to the lower level in 1996, and the Technology Center addition opened in 2005. These changes allowed the library to offer more educational opportunities and access to technology. More information about the library’s history, including a video tribute to former library director Richard J. Neuman, can be found at www.salinapubliclibrary.org.